The Secret Siren treasure chest is open NOW!! Treat Yourself! If you can't love yourself honey! How the hell you gonna love someone else! 1950's Rayon jersey, rose print vintage dress. The dress has full length sleeves with a square neckline, with corner bow detail. There is a flat fronted central panel with ruched side panels, from the hip to the bust. The overall shape is a slim fitted silhouette. The dress is mid-calf with a back kick pleat. There is a half belt that fastens at the back. 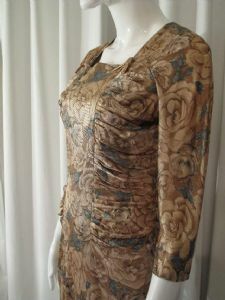 The print is allover rose print in soft stones, greens and khakis, which is very tonal and wearable.